The major requirement to lucid dream is to remind your self about reality, ‘knowing whether you’re currently dreaming or not’ which includes performing reality checks throughout the day. 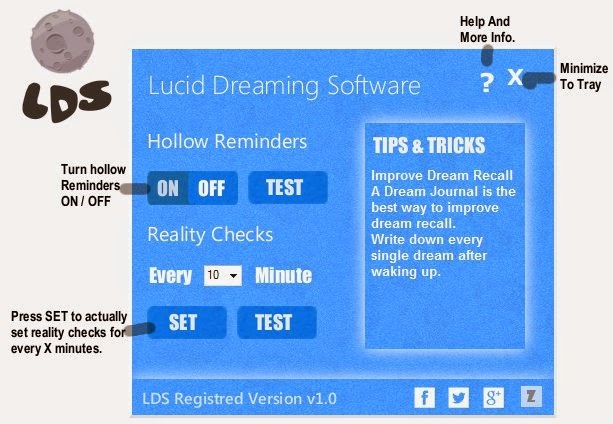 Lucid Dreaming Software helps you by reminding you to perform reality check while you’re on your computer. Software also introduces ‘Hollow Reminder’ technique which contains text ‘Am I Dreaming ?’ and ‘Is This A Dream ?’ floating around your screen every hour to remind you to perform reality checks. Lucid Dreaming Software also shows some tips and tricks which will help you to lucid dream. Note : As lucid dreaming skills varies from person to person SOFTWARE does not provide any kind of guarantee that you’ll be able to lucid dream for sure.Lucid Dreaming Software is a computer software to remind you to perform reality checks when you’re working on your computer.Reality Checks, Tips and Tricks and Hollow Reminders are just tools to help you induce lucid dream AUTHOR takes no liability for any kind of damages, use the SOFTWARE at your own risk. Very interesting article and application about which you are wrote. I have used this app for 1 years and everything was cool, but then suddenly I found even better program MessageBox Maker https://yumdownload.com/messagebox-maker that can help you to create your popup messages in the easiest way.